Chancellor Angela Merkel is poised for another election victory on Sunday. Merkel can point to strong economic growth and record low unemployment when asking voters for a fourth term. But all is not well in Germany and inequality has increased under her watch. The number of Germans at risk of slipping into poverty is the highest since the country's East and West were reunited in 1990. 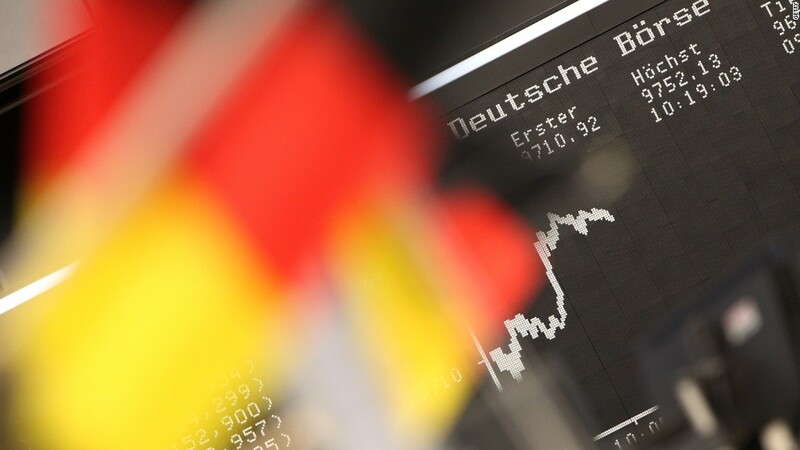 Germany's economy grew by 22% between 1991 and 2014, helping to fuel income growth of 12%. But the benefits have not been shared equally. The richest 10% of households saw their real incomes jump by 27% between 1991 and 2014, according to the German Institute for Economic Research. Middle class incomes increased by 9% over the same period, while households at the bottom saw their incomes drop by 8%. Wages paid to workers increased by 5% between 2000 and 2016. Meanwhile, income from investments and business activities jumped by 30%. Markus Grabka, an economist with the German Institute for Economic Research, said that weaker labor unions, tax reforms that benefited the rich and an increase in single person households have contributed to inequality. Outsourcing and automation have made the situation even worse. The income gap has translated into major differences in wealth. The richest 10% the population owns 60% of assets, while the bottom 40% have almost nothing, according to Germany's central bank. Inequality has risen steadily since 2005 despite unemployment dropping to record lows, according to Grabka. Grabka said the big question is whether all households "benefit from the strong recovery of the German economy." Huge efforts have been made to develop the poorer East since it was reunited with West Germany. But the risk of slipping into poverty is still significantly higher today in former Communist territory, where many industry towns have experienced a steady decline. "A large share of companies were closed in East Germany and the post-reunification construction boom [ran out in the 1990s]," said Oliver Rakau, chief Germany economist at Oxford Economics. 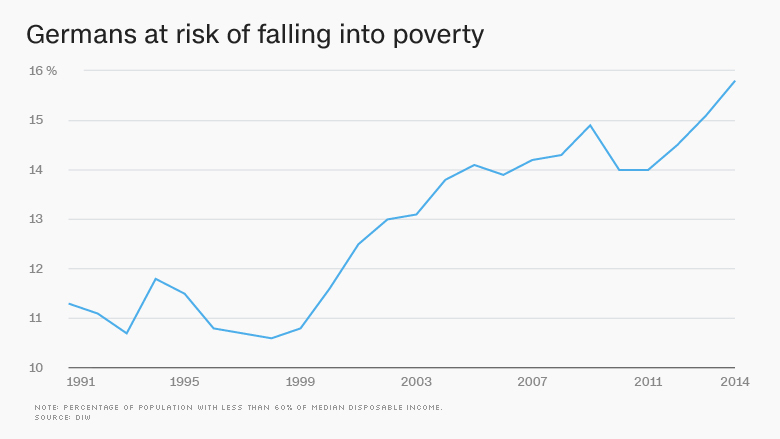 The share of Germans at risk of falling into poverty has jumped from 11% two decades ago to 16% in 2014. Grabka said that another key factor is an increasing number of jobs that don't pay well. Nearly 7 million Germans are working part time, precarious "mini jobs" that pay up to €450 ($540) a month. Many rely on welfare payments to get by. Germany introduced a national minimum wage in 2015 in hopes of tackling the problem, an initiative supported by Merkel. But the chancellor, whose slogan is "prosperity and security for all," has been largely silent on the issue of inequality during the current campaign. Her main challenger, Martin Schulz, has paid more attention to the issue, arguing that Germany is a successful exporter because wages are kept low.